Before diving in head first to take out a new contract for your phone, you need to have an idea of what it is you need from your phone contract. Start by looking at your current usage per month to determine how much you use your phone and for what purposes. Look at things like how much data you use, how much time you spend on phone calls, and how many SMS you send. Pay attention to when you make the most calls (during peak or off-peak hours? ), if you make calls to a different network or if most of your calls to a certain network (like mostly to your family members that are all on one network). This information can help you make an informed decision on which network to choose and which plan of theirs to select. Next up, you need to decide on which make and model of phones you are interested in getting. If you have no interest in a certain brand, then remove it from your short list, even if there are good deals on it. Remember that the more recently released smartphones are going to cost a fair amount more than previous models. You are more likely to get a better deal on the predecessor of one of the newest phones on the market. Once you have determined your needs and preferences, you will then need to look at for the best combination available on the market. Let’s take a look at some of the contracts available this year. For the sake of this comparison, we’ll be comparing similar plans from each of the networks on their sim-only deals (that is, it does not include a phone). Whether you’re looking for a pre-paid or a contract deal, MTN can help you out with plans that combine talk-time, SMSs and data. You can select from a range of different selections like their Made for Me plans, My MTN Choice plans, My MTN Choice Flexi plans, MTN Sky plans and a range of top-up plans too. Their Made for Me M plan will cost R249 and get you 150 minutes of talk-time, 100 SMS and 1GB of data per month on a 24-month contract. Vodacom offers customers contract, top up and pre-paid deals to suit your preference of voice and data plans. They all combine talk-time minutes, SMS and data. The Smart M plan from Vodacom consists of 120 talk-time minutes, 300 SMSs and 300MG of data each month for R322 on a 24-month contract. Cell C’s Pinnacle plans offer customers not only data, SMS and talk-time, but free black streaming too (that’s their entertainment streaming service). Their Pinnacle 1GB plan gets you 120 minutes, 120 SMS, 1 GB of anytime data and 2GB per day for black streaming. This will set you back R229 per month on a 24-month contract. Telkom only offers FreeMe plans for mobile users. For R100 per month you can get the FreeMe 1GB plan on a 24-month contract, which includes 50 SMSs per day, 1GB of data, free WhatsApp messaging and calling as well as free calling to any other Telkom number (mobile and landline). All of these plans are very different and appeal to different consumers based on their needs, making it very difficult to pick a frontrunner. 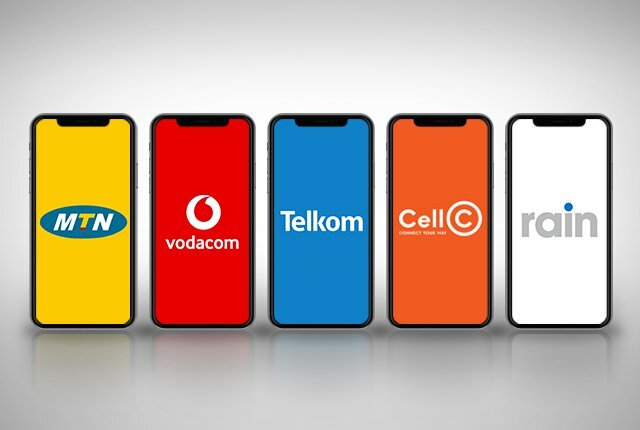 Since all of these service providers also offer new monthly specials on their plans as well as phone and SIM deals, you may need to shop around to find the one that’s best for you.